^ Population by Year-/Quarter-beginning. 1 October 2015. ^ Austria. Encyclopædia Britannica. Encyclopædia Britannica Online. 2009-05-31 [2009-05-31]. ^ CIA - The World Factbook. Austria. USA. 21 March 2012 [9 March 2012]. ^ 4.0 4.1 4.2 4.3 Austria. World Economic Outlook Database. International Monetary Fund (IMF). October 2016 [2016-12-04]. ^ 7.0 7.1 7.2 7.3 Austria. The World Factbook. Central Intelligence Agency. 14 May 2009 [31 May 2009]. （原始内容存档于10 June 2009）. ^ Probezählung 2006 – Bevölkerungszahl (PDF). Statistik Austria. 31 October 2006 [27 May 2009] （德语）. ^ Austria About. OECD. [20 May 2009]. （原始内容存档于6 May 2009）. 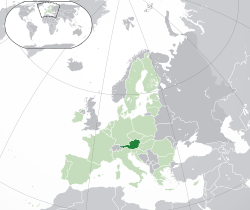 ^ Austria joins Schengen. Migration News. May 1995 [30 May 2009]. ^ 16.0 16.1 TOURISMUS IN ÖSTERREICH 2007 (PDF). BMWA, WKO, Statistik Austria. May 2008 [2008-11-18]. （原始内容 (PDF)存档于2008-12-18） （德语）. ^ 17.0 17.1 UNTWO World Tourism Barometer, Vol.6 No.2 (PDF). UNTWO. June 2008 [2008-11-18]. （原始内容 (PDF)存档于2008-08-19）. "奥地利教育制度Schulsystem in Österreich." Wikipedia. Die Freie Enzyklopädie.